Consider a routine scenario in advising business clients: two or more folks come to you with plans to start a company. Full of big dreams, plenty of optimism and the unshaking belief that nothing can go wrong, they ask you to advise on the critical issues of formation and capitalization. In addition to perhaps a dose of business reality, your clients (topic for another article) also need a document that governs the internal relationship between the owners of the new entity. The stockholders agreement (in the corporation context) or the limited liability company operating agreement (in the LLC context) serves this purpose and, when done properly, acts as a guide to the conduct of business throughout the life of the entity. The stockholders agreement is one of, if not the, most important documents to be discussed with your clients in the initial formation of a company. This article uses the terms “stockholders agreement” and “operating agreement” interchangeably and will focus on the use of such a document in the context of a corporation. The stockholders agreement governs the internal operations of the company through transfer restrictions, governance provisions and exit mechanisms. One may encounter clients that do not see the value in spending time or money to think through and draft all of the various issues associated with stockholders agreements. There may exist compelling reasons for deciding not to enter into such agreements in individual cases. As a general matter, however, particular attention should be paid to those clients who choose to forego such an agreement. Anecdotal experience suggests that some of the most expensive and protracted battles between stockholders have occurred following a decision by such stockholders that they did not need a stockholders agreement. This article will consider five common issues that attorneys and clients encounter in the preparation of a stockholders agreement. This article will also offer for consideration potential solutions to address those issues. A stockholders agreement is often used to commit, from a contractual standpoint, the stockholders of an entity to preserve the desired tax nature of such entity. Stockholders agreements are found in both S-corporations and C-corporations, but take on particular importance in those corporations where the stockholders have decided to make an S-election. The stockholder agreement should contain provisions that require and maintain the “allowable” shareholder criteria. Failure to do so may prevent an S-election or cause the corporation to lose S-status. Issue: The corporation needs to have the stockholder composition required to make and maintain an S-election. Fix: Establish internal criteria for the admission of acceptable stockholders of an S-corporation and, in conjunction with the transfer prohibitions discussed below, to prevent transfers to any person or entity who or which would not qualify as an “allowable” shareholder. Stockholders in an S-corporation will receive pass-through tax treatment on the profits and losses of that corporation. A common issue that these stockholders face is whether they will receive distributions from the corporation in an amount sufficient to satisfy the tax obligations resulting from such pass-through treatment. With this issue, the needs of the stockholders can conflict with the capital or cash-flow needs of the corporation. The appropriate resolution of this issue will depend on the specific circumstances of the corporation and its stockholders. A common fix is to provide for a distribution in an amount not less than the taxes owed by the stockholders. The amount is often based on an estimate of the aggregate amount of the highest federal and state tax rates to be paid by a stockholder. Issue: Stockholders may receive allocations of profits and losses and be taxed on those allocations without a corresponding amount of distributions necessary to satisfy those taxes. Fix: If appropriate for the corporation and its stockholders, establish a minimum amount of distributions to be made. Consider further the timing of such distributions as many corporations make distributions quarterly or annually. For any entity that manages to stay in business, the stockholder roster of a corporation will evolve naturally over time. Individual stockholders may desire to engage in financial or estate planning involving the creation of entities to hold their stock or to ensure that the ownership stays within a family or other concentrated ownership group. An entity stockholder may experience changes in the composition of its ownership base. Any stockholder may receive an offer to purchase or sell stock that causes it to reconsider its investment objectives. In addition to the tax considerations of ownership transfer (see the S-election discussion above), the non-transferring owners will have a strong desire to maintain other owners who share common characteristics (a family relationship, investment perspective or the desired timing of holding may all factor into the decision-making of the non-transferring stockholders). Issue: Some stockholders want and need some flexibility in the transferability and liquidity of an ownership position. Others want to avoid owning an entity with people they do not know. Fix: For voluntary transfers, establish a mechanism where a stockholder desiring to sell stock to a third party must first go through a right of first refusal or offer process. This process would give the company and the other stockholders the first opportunity to purchase the stock that will otherwise be transferred. This will ensure that the company and the other stockholders have a right to maintain control over the ownership base. At the same time, it allows the stockholder desiring a transfer to reduce or eliminate ownership in an entity. In the case of involuntary transfers, create a process where the transferring stockholder is deemed to have offered the stock to the company and the other stockholders in advance of the event creating the involuntary transfer (divorce settlement, bankruptcy and death are common examples of triggering events). The stockholders agreement can also contain a “permitted transferee” concept where an owner has the ability to transfer the stock to a spouse or family members or entity created for such persons. A corporation often has stockholders with classes of stock with negotiated rights and preferences. In addition, some stockholders may have rights not shared by other stockholders due to the percentage of stock owned or, in some cases, the timing of the stock purchase. A common right for many stockholders is the ability to cause other stockholders to vote for a proposal made by the first stockholder. The stockholder with this right wants to make sure that an extraordinary proposal, such as a plan to sell the company, will not be held up or face other execution risk due to a recalcitrant holder of a minority ownership stake. Stockholders may also want the right to commit the other stockholders to vote for such things as certain board member positions and the engagement of outside advisors. Issue: A corporation often needs to allow a majority or dominant stockholder to take certain actions with the comfort and certainty that the stockholders agreement will compel the other stockholders to support those actions. The dominant stockholder also wants to eliminate the ability of a stockholder with a much smaller ownership stake to slow or stop a proposal supported by the dominant player. Fix: Include a “drag-along” provision in the stockholders agreement. This provision will accomplish the aims of the dominant stockholder while limiting the rights of the smaller stockholder. This provision can also be used in negotiations with third parties to counter any concern about the ultimate ability of the first party to do a deal. The dispute resolution provisions in a stockholders agreement can often be overlooked as boilerplate and not worthy of sufficient time and attention. Certain aspects of these provisions, however, can make a major difference in the speed and ease in which stockholder disputes are settled. Establishing governing law and venue for the hearing of disputes at the outset of a business relationship can prevent a race to the courthouse and the cost and confusion of adjudicating multiple claims. In addition, the waiver of a jury trial may be an appropriate way to have a stockholder dispute considered by a court. Some stockholders agreements go further to require mediation or arbitration as a way to ensure that disputes are heard by a neutral who possesses certain characteristics such as educational background/training or industry knowledge. Issue: Create a dispute resolution framework that is equitable to stockholders of a company who may possess disparate resources, business sophistication or access to the court system. Avoid a process that could tie up a company in expensive and protracted legal battles. Fix: Have the stockholders agree on the following mechanics: (i) what will be heard; (ii) where will be it heard; (iii) who will hear it; and (iv) identification of the law to be applied. An agreement on these details should have the long-term effect of reducing frivolous claims while providing all stockholders with appropriate access to a dispute resolution process. 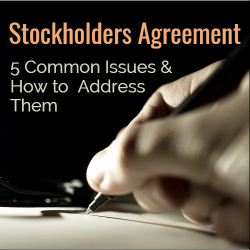 There are numerous other issues that bear discussion in the drafting of a stockholders agreement. Unfortunately, space limitations require that this article be limited to those herein. It is hoped that the stockholders guided by counsel who carefully consider the issues highlighted in this article as well as those other issues may find the time and resources well spent. J. Andrew (“Andy”) Robison is a partner and chair of Bradley's Corporate & Securities Practice Group. Andy primarily advises clients with mergers and acquisitions, securities offerings, divestitures, joint ventures, and general corporate and securities law issues. He spends a significant amount of his time working with private equity funds and their portfolio companies. He can be reached at arobison@bradley.com.